The Partnerships for Reform through Investigative Science and Mathematics (PRISM) GK-12 Program is a unique partnership between the Hawaiʻi Island Department of Education (HIDOE) and the University of Hawaiʻi at Hilo (UHH). This collaboration will bring together the science-content knowledge of faculty and graduate students (PRISM fellows) of the UH Hilo Tropical Conservation Biology and Environmental Sciences (TCBES) Masters Program with the teaching skills of lead teachers in K-8 schools on the island of Hawaiʻi. 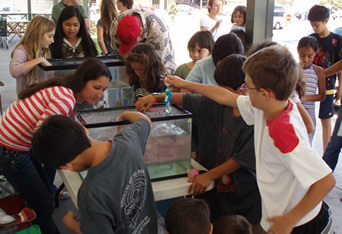 The program is funded by a National Science Foundation grant. A central goal of PRISM is to improve the interest and performance of Hawaiʻi K-8 students in math and science. This goal is addressed through the creation of investigative, standards-based curricula in science, math, and technology that are both relevant and accessible to Hawaiʻi’s rural student population. 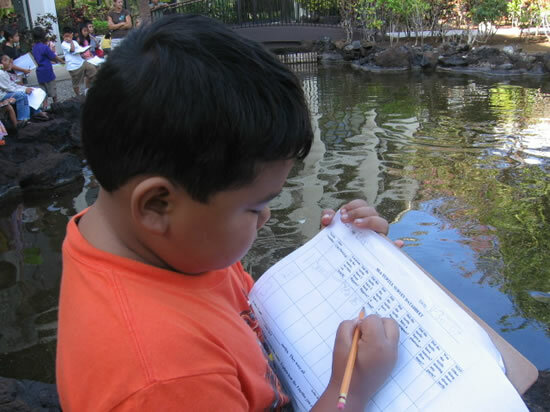 Through the creation of new curricula and the modification of existing hands-on lessons, each teacher-fellow partnership will produce an enhanced curriculum module that demonstrates science in Hawaiʻi. Current modules include activities on the sandy shoreline, the Northwest Hawaiian Islands, the open ocean, coral reefs, insects, genetics, and adaptations, as well as several other important concepts, ecosystems, and specific animals. Lessons within these modules are designed to bring the students in touch with the environment and how science helps us to discover and investigate the world around us. The lessons learned through the development of partnerships among PRISM teachers and fellows will be evaluated through formative and summative assessments and posted online. UH Hilo and HIDOE have also partnered with the experienced program staff from the Lawrence Hall of Science at the University of California Berkeley, and the Science and Math Education Resource Center in Washington D.C.